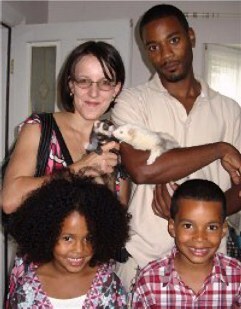 IKE WAS ADOPTED AUGUST 19, 2008! Ike was found wandering in somebody's back yard. 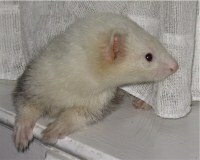 It is possible for ferrets to escape from a home but unfortunately it can also be that somebody no longer wanted him and let him go. 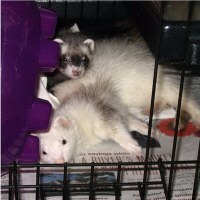 Contrary to what many people think, ferrets are not wildlife and cannot survive more than a few days outside. So regardless, lucky for Ike that he was found and taken to a shelter. He is now in one of our foster homes. 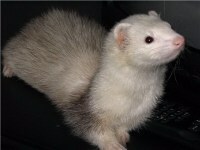 Ike is a very sweet ferret. He is not at all nippy and is very easily handled. We are guessing him to be around 1 1/2 years old and he weighs 1.8 pounds, on the small side for a male. He has used the litter box in his cage consistently. If he is running around the room and the need arises, he will hop into the cats' litter box and avail himself of that option. 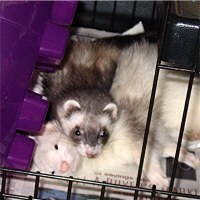 Ike gets along very well with other ferrets and with cats. He would love to go socialize with the dogs but for his own safety, that is not happening. 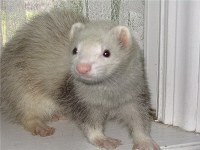 Ike has been checked by our veterinarian and received his rabies shot. He does have ear mites so he is currently undergoing treatment which involves a shot of ivermectin once a week, three times. He will be able to get his distemper shot in two weeks which will coordinate with his last ivermectin shot, so he will be available for adoption towards the end of August. We will accept applications for adoption in the meantime. Ike's adoption fee to help offset his vet costs will be $50.